Mercedes has officially started producing the updated version of the AMG GT. Big deal, you say? It's just a facelift, right? Well it is, but it also brings with it a new top-of-the-line version that's the most performance-focused yet. It's the GT R Pro, it's about the closest thing we've seen yet to a Black Series version, and it's the first of the updated models to roll off the line at the plant in Sindelfingen (the part of Stuttgart where Daimler is based). Its production follows four months after its public debut at the 2018 LA Auto Show. 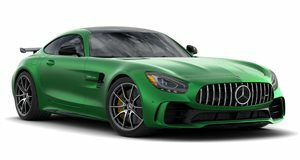 The Pro model packs the same 4.0-liter twin-turbo V8 as the existing GT R (and so many other AMG models), and produces the same 577 horsepower and 516 lb-ft of torque. But everything else has been tightened up and enhanced, from the stiffer suspension to the aero package. The upgrades net a 0-60 mph time quoted at 3.5 seconds, a top speed of 198 mph, and a Nürburgring lap time of 7:04.632 – over five seconds quicker than the standard GT R, and faster than any other road-going Benz ever clocked around the famed German circuit. Of course the GT R Pro isn't the only version of the revamped model on offer, which also includes coupes and roadsters in base, C, and R specs (the S model having been discontinued). They're all built by hand along a dedicated assembly line at Daimler's main plant.